Want to indulge in something fantastic and beautiful like these splendid blooms? Go for this vibrant bunch of flowers which has been formed with a diverse variety of roses and alstroemeria. To give a fuller look, a bunch of peach berries with fillers are tied together with jute thread for an elegant look. 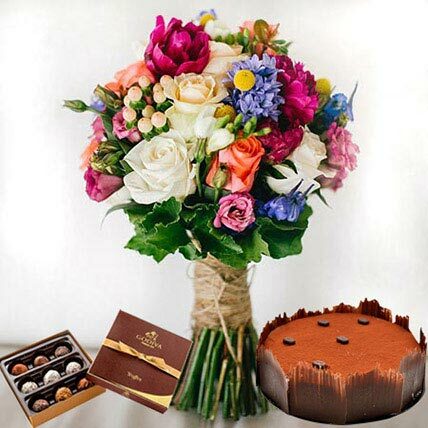 You can also pair it up with a delicious Tiramisu cake and Godiva chocolates which form a delicious gift combination for your loved ones.